If you’re in the market for a new mattress, you have likely discovered that there are a lot of different mattress options. It can be overwhelming to narrow down your search, especially if you don’t know exactly what each type is. For now, we’ll be focusing on pillow top mattresses. These are mattresses that have an additional layer or section on the top. The purpose of pillow top mattresses is additional padding, which means that you will be extra comfortable. The top is stitched onto the base of the mattress, so it’s all one cohesive mattress. Before purchasing a pillow top mattress, there are a few factors that you need to consider. We will get into those later on. Be sure to decide what is most important to you before you begin shopping. This will help you to find a mattress that meets your needs and keeps you comfortable. We’ve narrowed it down to help you find the best pillow top mattress available. 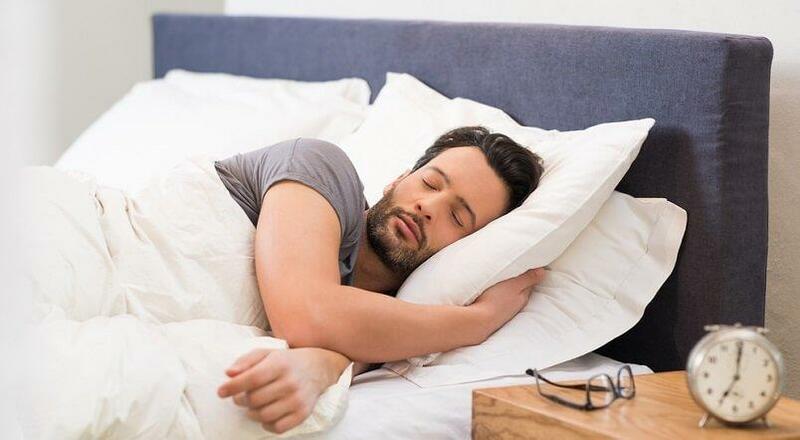 The right pillow top mattress will be comfortable and help you to get the sleep you’ve been dreaming of! Take a look at these pillow top mattresses so you can decide which one fits your needs! The Zinus Ultima Comfort 10 Inch Pillow Top Spring Mattress is one of the more affordable pillow top mattresses out there. Luckily, the lower price doesn’t equal poor quality here. It has excellent support, which is designed to relieve pressure in your body. It offers alignment support as well. Overall, this is a great mattress for a good night’s sleep. The pillow top is made of Pressure Relieving Comfort Foam, leaving you with an extra comfortable surface. The springs in this mattress add to the comfort as well. It has been helpful at relieving users’ pain at night. If you’re looking for a variety of sizes, this is the mattress to go with. It comes in an assortment of sizes from twin to king. The thickness ranges from 8 inches to 13 inches, depending on your preferences. Zinus offers a 10-year warranty, which is great for such an affordable mattress. 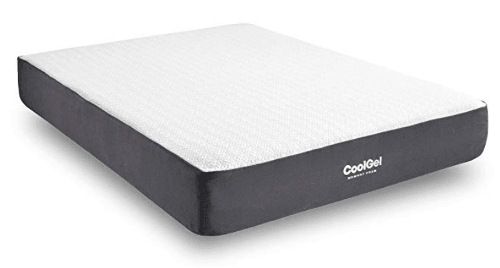 The Classic Brands 10.5 Inch Cool Gel Ventilated Memory Foam Mattress is one of our favorites for a number of reasons. It’s perfect for anyone who’s unsure of the firmness that they’re looking for. It offers a medium firmness. This will give you a neutral place to start so that you can decide if you’d like a firmer or plushier mattress in the future. This mattress is supportive and also works to prevent tossing and turning throughout the night. For some people, this is a minor change that can greatly improve their sleep and energy. Just like the previous mattress, this one comes in a variety of sizes. It goes all the way from twin to California king. This is nice, because you don’t have to settle on a mattress you don’t love due to sizing issues. One downside is that it only comes in one color. This shouldn’t be too big of a concern though, especially due to the use of sheets. Classic Brands offers a 10-year warranty, which helps to give you the peace of mind in case anything happens. A 10-year warranty is pretty common but it seems long enough. The first thing that you will notice about this mattress is its steep price. Because of that, this mattress just won’t work for everybody. If you are someone who has some extra money to spend, this is a great option for you! This is another pillow top mattress that comes in a range of different sizes. It only comes in one thickness level, but it seems to do the job. Some users do prefer the option, just in case. It really depends on your own preferences. The plush top is very comfortable, but it has decent support. It can be hard to find a mattress that offers both cushion and support. This one does it well! The Serta Perfect Sleeper Select Super Pillow Top 500 Innerspring Mattress is made up of gel foam and innersprings to improve your sleeping experience. Serta’s exact warranty information is not published, so it could be limited or non-existent. This is something to consider if warranties are important to you. This doesn’t give you the protection you might be looking for when purchasing a large item. 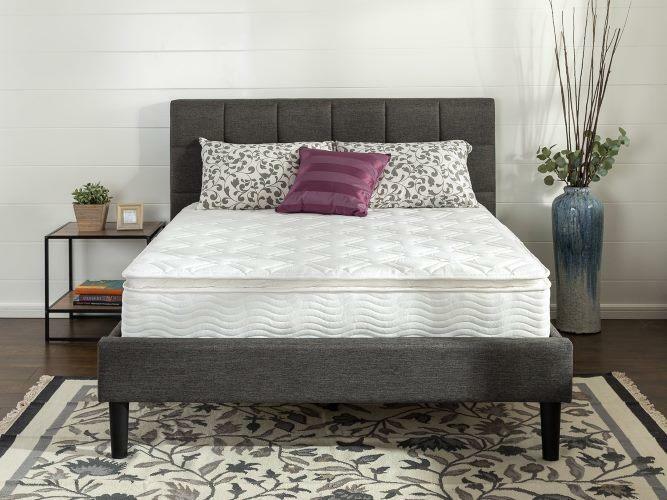 The Signature Sleep 13” Independently Encased Coil Mattress is a pillow top mattress that’s on the more affordable side. Unfortunately, this one isn’t as high-quality as we would expect. It’s not a bad choice altogether. It does only come with a 1-year warranty, which complicates the durability issue further. This is one of the best pillow top mattress queen options. It only comes in queen and king sizing, which can be a downside. Of course, some people only need those sizes, so it may not be a huge con to some shoppers. It has a good height and cushion. It seems to be decently comfortable, but this might not last for long. It’s a good enough mattress, but it might be better to use it in a guest bedroom or as a backup. 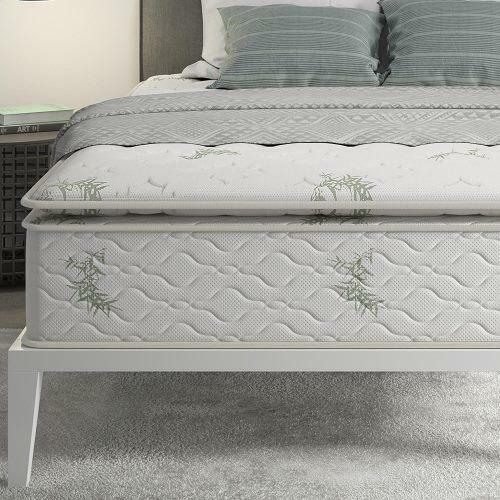 One plus is that this mattress is breathable, making it a great choice for anyone who gets hot during the night. A breathable mattress can be helpful when dealing with night sweats. The Dreamfoam Bedding Ultimate Dreams Crazy Quilt is another pillow top mattress on the more affordable side. It can fit in almost anybody’s price range. It has plenty of other benefits as well. The cushion is medium, giving you the perfect balance between plushness and firmness. It offers wonderful support at the same time. As mentioned previously, this can be tricky to achieve. 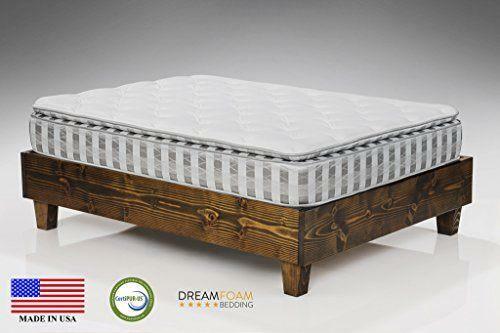 The Dreamfoam Bedding Ultimate Dreams Crazy Quilt does this well and should give you a great night’s sleep. One downside is that this mattress isn’t as durable as some of the other mattresses on this list. This is due to its price and less well-known name. Additionally, the warranty information isn’t published. This means that you might not be able to get the mattress fixed if something does happen. Nonetheless, this mattress is still affordable and comfortable. It’s worth trying, especially if you haven’t used a pillow top mattress before! What Should I Consider When Shopping for a Pillow Top Mattress? It might seem overwhelming, but there’s a lot to keep in mind when you’re shopping for a pillow top mattress—or any type of mattress! The search has to go beyond the question of “What is the best pillow top mattress?”. There’s plenty more to consider. Luckily, we’ve broken it all down for you. This will streamline your mattress shopping process and make it easier for you to find exactly what you’re looking for. These considerations are in no specific order. You can use this list to come up with your own list of priorities. For example, you might be willing to spend more for a high-quality mattress. Price can move further down on your list, because it’s not as important to you. Comfort- One of the main reasons that people purchase pillow top mattresses is for additional comfort. Plus, you will be sleeping on this mattress every night. You want to make sure that you are buying a mattress that is comfortable. It can be tricky to know how comfortable a mattress will be until you actually sleep on it. Read reviews, and look for a company with a good return policy or trial period. Warranty- Every company will offer a different warranty—or none at all. The more money you are spending on a mattress, the longer you will hope the warranty is. This is generally true but not always. A warranty is not necessary, but it is nice to have. Return Policies and Trial Periods- Return policies and trial periods can be very important when you’re shopping for a mattress. You want to make sure that the mattress is just what you’ve been looking for. It’s hard to do this with online shopping. Luckily, some companies offer trial periods so that you can send your mattress back if it isn’t what you were expecting. Additionally, return policies can be helpful in case your mattress doesn’t function as well as it should. Again, these policies are not mandatory, but they can make a big difference in your mattress-buying experience! Size- This is pretty self-explanatory, but it is often neglected. You need to make sure that you’re purchasing the correct size mattress. Occasionally, shoppers will forget to double check on their existing mattress size and guess. This usually happens with full and queen sized beds. To be on the safe side, you can take measurements of your current mattress and bedframe before going shopping. Thickness- Mattresses come in different thicknesses, which can affect the overall comfort level. Because pillow top mattresses have an extra couple of inches on top, this isn’t a huge concern. It should still be considered though. Most mattresses come in a range of thicknesses anyway, increasing in price as they increase in thickness. If you’re unsure of what type of thickness you want, pick something in the middle. Then you will know whether you need to go thicker or thinner in the future. Price- Before going mattress shopping, you should have an idea of how much you would like to spend on a mattress. Get a good idea of how much your mattress type of choice will cost you so that you can come up with a reasonable budget. Everybody’s budget will be different. There are plenty of decent mattresses at affordable prices. Naturally, the nicer mattresses are going to cost more. Firmness- This factor is less important with pillow top mattresses. They simply aren’t as firm as other types of mattresses are. Still, it’s necessary to figure out just how soft or firm you want your mattress to be. When in doubt, opt for a mattress with medium firmness. This will keep you comfortable but still make your bed feel sturdy. If firmness is one of your top concerns, do your best to look for the best firm pillow top mattress. Durability – Very few people would purchase a mattress if they knew it would only last for a couple of years. When you’re looking for a new pillow top mattress, be sure to look for a durable option. This will help ensure that you don’t have to get a new one right away. Reading reviews is a great way to discover just how durable a mattress is. Look for reviews from people who have used the mattress for a year, if possible. They will be able to tell you how well it holds up after being used for so long. Purpose – If you’re specifically looking for a pillow top mattress, you are likely looking to sleep on the mattress every night. Maybe you just want to give your guests a comfortable place to sleep. Be sure to keep the purpose in mind, because it can have an influence on the other factors. For example, if a mattress will only be used a few times per year by friends and family, it doesn’t need to be as durable as a personal mattress. Add-Ons- If you want the option of having a pillow top mattress and a standard mattress, you can invest in accessories like mattress pads. For instance, you might be looking for the best pillow top mattress pad. These can be used on top of a standard mattress and turn it into a pillow top mattress. This is a nice option to have in case you decide you don’t love the pillow top mattress. As you can see, there are plenty of excellent options for pillow top mattresses. It’s important that you do your research to find the one that meets the most of your needs. Luckily, all of the mattresses that made this list are going to be comfortable and give you everything you’re looking for. We chose the Zinus Ultima Comfort 10 Inch Pillow Top Spring Mattress as our favorite. It’s affordable, comfortable, and offers a pretty good warranty. Overall, it’s a great pillow top mattress for a great price! Of course, any of the mattresses on this list are comfortable and durable. To find the one that you like the best, figure out which features are the most important to you. This can help you to narrow it down and come up with the the one that suits your needs. Lastly, be sure to take advantage of flexible return policies and trial periods to make sure you’re getting exactly what you want!